I’m so excited to introduce you to a product today that is actually designed to make thin hair look more beautiful. 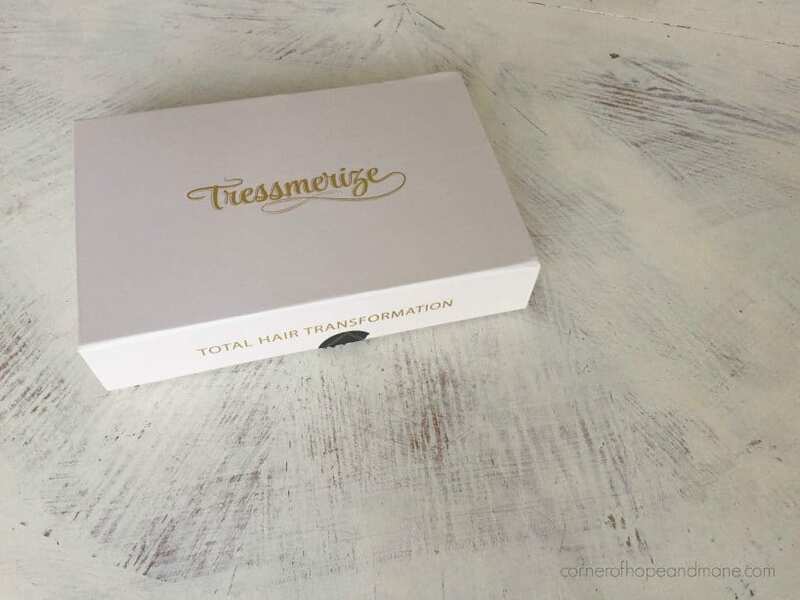 Tressmerize is a topper + extension kit that was specifically created to transform thin hair (bonus: it even works on short hair, as long as it’s 3″ in length). What I love best about the Tressmerize kit is that it’s available in some amazing color options. Most human hair is all one color, which has always made me nervous because I just don’t feel like it’s the most natural look on me. It looks great on other women, but it tends to fall flat on me (if you’re someone who prefers just one color, Tressmerize has you covered, too!). I was super-excited to see TressChic, a gorgeous blend of medium brown with blond highlights, and knew it was the color for me. My friends at Tressmerize were kind enough to send me a Tressmerize kit to try—I had so much fun playing with this hair! The hair is incredibly soft to the touch…as much as I love my synthetics, it was so nice to feel the “fineness” of human hair again. Here’s me, without helper hair (uh, duh) or any concealers. Say hello to my incredibly thin(ning), mousy brown hair. About 10 minutes later, my Tressmerize topper + extensions kit is installed (their site has instructions, and the kit comes with details, too). Here is TressChic, right out of the box. Is this color not gorgeous?! Totally drool-worthy. Tressmerize is 16″ long, which is perfect for me and my length of bio hair right now. Of course, what I was most excited about was adding some waves into my new hair. That’s the one thing I miss with synthetic hair—being able to add curls or waves on a whim! I was really out of practice (I don’t think I’ve curled my bio hair in close to five years), but it was kind of like riding a bike. It took me about 20 minutes to curl my hair. Ahh!! I love having waves again! And apparently my husband loves them, too, as his jaw hit the floor when he saw me. The system is pretty easy to install, and I’ll try to explain it, although it’s best explained by looking at directions on the Tressmerize site. You just put your hair in a half ponytail and place the widest clip-in Remy hair extension around the back of your head. Two more Remy wefts are placed right above that at top-left and top-right. Re-part your hair at the temple area and let some of your bio hair fall over the extensions. Clip in the two side-wefts and apply the topper. And then swish your head around and feel like the Mermaid you look like! One note: the topper has adequate coverage, but it’s not meant to cover a ton of area in the back. If your level of loss is close to mine, you’ll need to make sure that your bio hair has volumizing product on it, and it’s teased to both help it stay in place and add as much body as possible. Overall, I am loving my new look and am thinking this is PERFECT date-night hair. In fact, it was—I wore this system out for Valentine’s Day dinner. Want to try a Tressmerize system for yourself? 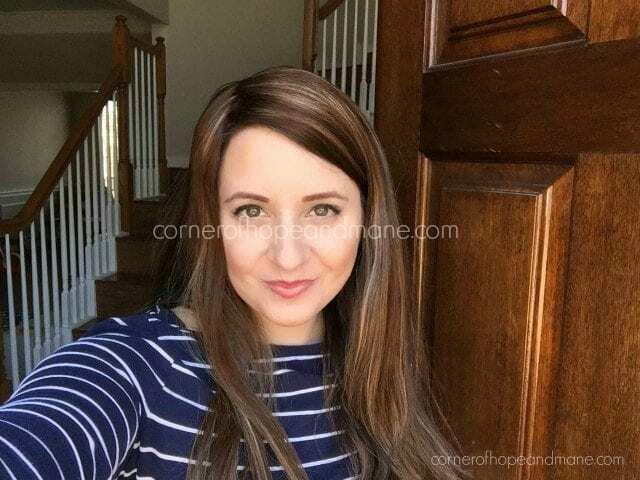 Corner of Hope & Mane readers get $20 off with code LAUREN20. This is an awesome deal, because Tressmerize is incredibly reasonably-priced (promise! ), to begin with. Want to read more about Tressmerize? Since this post, they’ve updated their toppers to be a larger size, and I have pics and a review of the new Tressmerize topper! Feeling lucky? Enter to win a FREE Tressmerize kit! This is the perfect way to ease into wearing helper hair (and who knows, maybe this solution will be “the one” for you!). What do you you think of the waves? Have a question about the Tressmerize system? Let’s discuss! Official sweepstakes rules: Open to U.S. Only (so sorry, Canada, your beautiful country has some wacky giveaway laws! ), 18 years and up. Update: Congrats to our winner, Patricia! She has been contacted and is excited! « Can You Glue Your Topper To Your Head? Dear Lauren! I am so glad that you are enjoying Tressmerize. Thank you so much the review. I love it!! I can’t wait to try this!! You look beautiful Lauren! and gorgeous hair! Does Tressmerize make normal fuller toppers too? Thanks, Em! No, the toppers only come in one size/density. Hi Em, current density is 50 grams and that’s the only topper density that we have. Tressmerize looks like a great way to try out helper hair. Awesome giveaway! Love the natural curls! This is absolutely gorgeous on you! Oh wow! I would love to give this system a try. 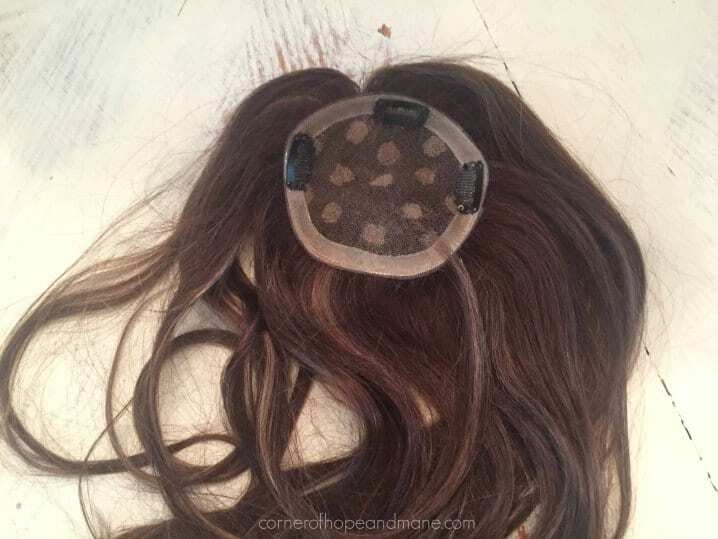 I’m currently wearing a topper and clip in extensions everyday due to hair loss (my loss pattern is similar to yours) and I love the idea of a system for thinning hair. Finally someone is thinking about us hair loss girls! Sorry to hear about your hair loss Missy!! Good Luck! It looks beautiful. Are you wearing all of the pieces? How does the part look? Natural? Do you think you can still put this up in a pony tail? Love to hear your feed back. Yes, I’m wearing all the pieces here. It’s a mono top so there is a part line, which is good. The part is on the denser side, so if you like a wider part you might want to tweeze a few hairs out (which I think would be possible, but I have not tried). You can see different hairstyles that I create on our blog with wearing Tressmerize. 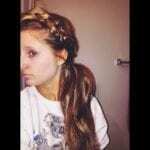 I have done all kinds of ponytails, updo’s, braids and many different styles. There is a way to install them so that they lay flat against your head when putting them up in a ponytail. I do have a video on that as well. Love the look on you Lauren. Thank you Xochiti! Good luck! I would love to try Tressmerize, looks like the perfect combo for me. I usually have Jon Renau. This is such a perfect kit. And while it is expensive, it isn’t bad considering it would cost more to buy both components separately. I just recently got clip in extensions, and it is really hard to make them work without a topper. I’m really excited about this idea! I would obviously prefer to win, but it’s definitely also going on my “to buy” list. Thank you Kris! I completely agree that it is hare to blend clipin’s in thin hair, that’s why I created the kit. 🙂 Good Luck to you! I really love it! What size of curling iron did you use??? So pretty!! You look fantastic! Thank you for the chance to win some awesome hair! Thank you Leigh! I agree that Lauren is stunning! 🙂 Good Luck to you! I gotta say that looks AMAZING on you!! And it looks like super gorgeous healthy hair too! My hair may be a tad too far gone for that, I’m not positive, but it looks like a super great system that could work for a lot of people! I’ve seen them on Instagram! This looks amazing and I would love to try it! Hey Mandy! Great to hear you’ve seen Tressmerize on insta!! Good Luck Lovely! I love it. I need it. Ugh. I love the blonde highlights = I think highlights make our hair more realistic. I’m the same brownie color as you! Can’t wait to try this! Lauren, you look gorgeous!The hair is beautiful! What about the clips? You had extensions and the topper attached.Were you feeling comfortable? I have a sensitive scalp and want to make sure as this Tressmerize kit looks like a good alternative for my hair loss! Yes, plenty comfortable! The silicone lined clips help to keep everything snug and comfy. I think I really need this system! I love the look and yes, I have always loved mermaid hair! I love the color and look on you! So cute! Beautiful. I would love to try this, I am overdue to start wearing hair but have no idea where to start. Then again I always had crappy fine hair so maybe it’s a chance to get “dream hair” instead of just normal hair! The curls look beautiful and so natural! I’m definitely going to have to check this system out! What a great combo kit. It sounds easy to customize to your own needs as well. Looks great Lauren! Thank you Amy! Good Luck to you! I would like this, but I have curly hair. It does not come curly. Would I have to curl it every time I wear it, or will the curls last until shampooed out? This hair held the curl surprisingly well, however, I would expect you’d need to touch it up almost every time you wear it. It acts just like normal, straight bio hair…sometimes the curls last, sometimes not, depending on product used, weather, etc. Hi Dina! 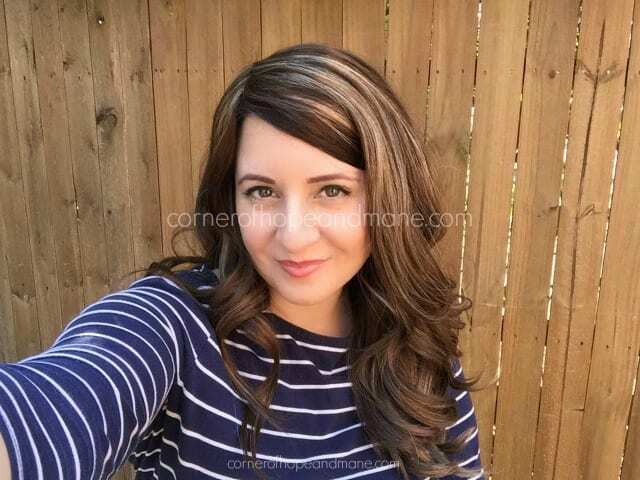 One of our customers left a review on our site with wavy hair. This is what she said. “After wetting it and scrunching it dries wavy like my own hair which is a huge bonus as well”. If you have really curly hair, I think that it would be harder to blend the topper in with your curly hair. One of our customers with really curly hair, had to straighten her natural hair first install the Tressmerize in and curly it together so it blends. If this is something that you are not willing to do then it might not be the best option for you. Hope that helps! I hope this is where you enter for the hair piece as I would love to win. My hair is so thin and I am so embarrassed of it, and my daughters wedding is coming up soon and it seems like no matter where I go I am always the woman with the uglist hair.Sometimes I would just love to hide in my house forever. Hi Christine, just make sure you are also clicking “I left a comment” in the entry form – thanks and good luck! Good Luck Christine! I am sorry that you’re going through this. Wow! I absolutely love how natural it looks! Oh my gosh this is gorgeous and gives me hope for the human hair journey! Thanks Alisson. Good luck lovely! Really excited to try this! Are there a good selection of other blends with highlights? I have lighter brown mixed with highlights. We have TressExotic Shade witch is light/chestnut brown with blonde highlights Kristi! This looks amazing on you! I would love to try this out- what a great idea! It sounds like this would be less hot than a full wig, too. Is that the case? For me it was a huge plus Anne because I couldn’t wear wigs in summer months. I was getting headaches. With Tressmerize because it’s different pieces clipped in you get a breathing room throughout your head. It’s just gorgeous on you Lauren! I especially love the waves & the highlights. Great looking system, thanks for the review. I’m excited to try this and would love to win! I’m still using tons of powder and two different types of hairspray to cover my bald spots. It takes SO long to fix my hair every day…it’s just really depressing. Thank you for the review and the blog, I feel like I’m not alone in this journey. You’re definitely not alone Sheila! Good Luck to you! I would love to win a tressmerize kit for my fine thinning hair. I’m 32 and on top of getting balder by the day, now my very dark brown hair is turning white! Not cool when you’re in college with a bunch of 20 year olds and already feel ancient. I’m going to embrace it by doing the granny hair/opalescent trend so I can chill on the dying. Unfortunately, my current kit matches my first natural color so I need a new one. Good luck to everyone entering and suffering with thin hair! Lauren you look Fab, like always!! I would love to try the tressmeriz system. Thanks for the chance. Thank you Darlene! Good Luck to you! Our manufacturer purchases hair from the donors that are hired to grow their hair. During the years or months of their hair growth journey, these women are not allowed to use any coloring product on their hair. 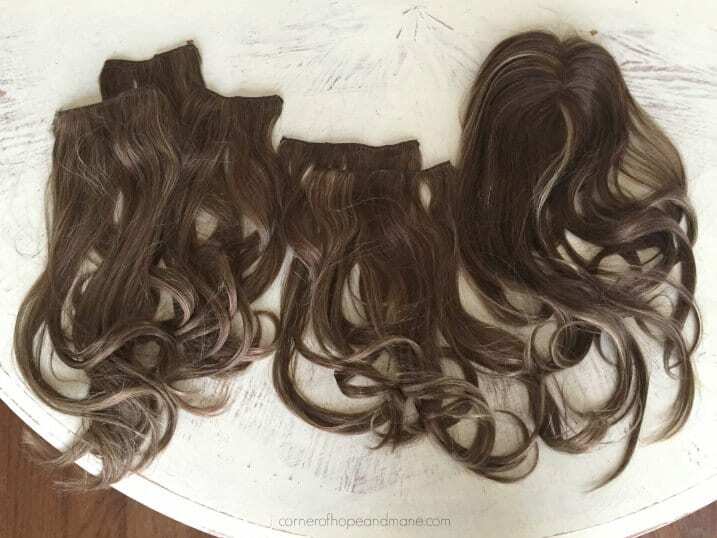 When the hair reaches the certain length they cut the hair and this hair is washed through a very specific washing process and used to create the human hair extensions, wigs, and toppers. 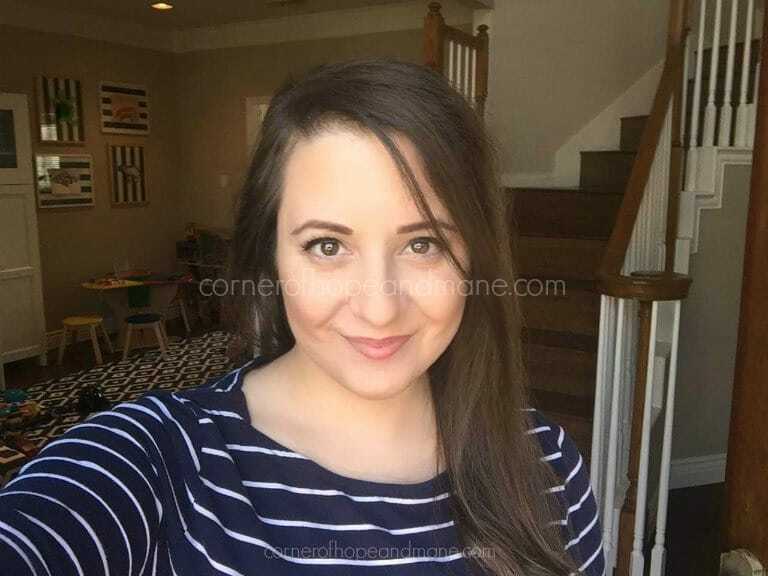 Lauren–wow, Tressmerize looks amazing on you!! Enjoyed seeing the review! If my hair could look as nice as yours, well, I’d be soooo happy!! Whoever wins the kit, please post photos!! It’s so fun having waves! OMG! Lauren AND Tressmerize – it is stunning! Thank you for informing us all of this gorgeous looking product! and Lauren, how lucky are you that you’re getting such fabulous samples!! Yay! I had not heard of the product before so kudos to both of you for showing us. I’ll keep my fingers crossed that I get lucky and win! Could definitely stand some good news about now. And Lauren, you continue to describe these products in such a wonderful way that we all get the first hand info and are anxious to try! Thank you so much Lyn!! Good Luck to you! Sending positive vibes! It looks so great!! Your bio hair alone is really pretty too. Love the waves you put in looks gorgeous! I’d love to add a bit of flair to my hair with extensions. I agree with everyone here, you look stunning! My hair is getting to the point where I can’t hide my loss anymore. So it’s probably time to start wearing some helper hair. Thank so much for reviewing this system for us, it looks amazing! Thank you Lilly! Good luck to you! Thank you Dawnita! Good Luck to you! Lauren, your hair looks great! I love the curls too. Very pretty! That is what I miss the most, being able to curl my hair. I have been hiding my loss by wearing a hat or a carefully placed headband. I am going to look into this system. I like that it doesn’t have a lot of volume. My bio hair never was very full and that is what I have been struggling to find in the helper hair world. Thanks for introducing this to us and for the chance to win one! I am sorry about your hair loss Jennifer! Good Luck to you! My hair is rapidly thinning not just frontal/crown, but seemingly from everywhere! I am not ready for a full-on wig yet, so the topper + extensions seem like a wonderful compromise. My normal hair (pre-thinning) is on the fine side, so HH is what I prefer. Thanks for this opportunity! Thank you Jennifer! Good Luck! Beautiful look and what a lovely system! You make their hair look gorgeous! I would love to have that feel of human hair again. Can only afford synthetic right now, but would love to have the opportunity to try Tressmerize! This system looks amazing and stunning on you! What a great idea,topper plus extensions for hair loss. Sounds perfect!! Been looking for a real hair topper! Tried one but it wasn’t very good. Would love to try this one by Tressmerize since you love it. I know it will be good. Thanks for doing the research and trying it for all of us. Thank you Barbara! Good luck to you! I would love to try this to. Cover the large bald spots on the top of my head. They are getting hard to cover and I’ve never tried a topper before. I currently only use hair powder but would love to try a hair topper! Love this look on you! Thanks for the product review! I am looking for a more affordable human hair option than my current topper (which is AWESOME but PRICEY)! Thanks! Just curious if you feel like the wefts would show if it were windy out. Is it something that looks great when it’s just sitting? Or would it continue to loon great if it were windy. I know it’s a random question, but it’s windy here lol! Hi Amy – I think that will depend on how you wear it. Because I have so much frontal loss, I have to wear the topper portion pretty darn close to my hairline. This means there will be less coverage in the back. I do have diffuse loss all over, so my back is sparse but not as bad as the front. If it’s not windy and I make sure my back has adequate volumizing product and is teased properly, I don’t think there would be any issues. If it was windy, I’d probably be concerned the wefts would show in the back–so, I can only speak to how I have to position the piece and my level of loss, but I hope that helps. Thanks Lauren, that helps a lot. I currently have a Milan so I don’t worry about the back coverage but I was/am considering this system as an everyday option. Your feedback is great and much appreciated. I’m still on the fence but I love the idea of a lighter, more natural feel! You look amazing! I love the coloring. So salon perfect! I think this is your best look yet! 🙂 love! This looks so great on you! I am trying to get the courage to start wearing helper hair and this looks like it might be a good start. Thank you so much for writing this blog! Love the look and have been trying to get up the courage to buy a topper for a few years. It just sounds like this might be a good way to start. This system is beautiful! I would love to win it and jumpstart my hair wearing journey! Thank you Julie! Good luck to you! Hi Lauren, love the curls on you! 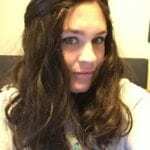 I currently wear synthetic toppers every day, would it be possible to ever wear the Tressmerize topper portion only, if the rest of my hair would blend in? What are the dimensions of the mono inside? I can’t seem to find a pic of the inside. I love the idea of “real” hair and all the extensions, but I all those beautiful extra extensions might be best for a special occasion as opposed to everyday. Appreciate your thoughts regarding this, and thank you as always for sharing!! Hi Robin, the size of the base is 4″x4″. You can wear the topper only if your hair is longer if you have shorter hair then you would have to cut the topper so it matches the length of your hair, otherwise it wouldn’t look right. Hope that helps. Tresmerize is the best hair set I’ve found that includes a topper. It includes everything you need!!! I purchased a set and colored them burgundy and it looks amazing. The color really holds and people ask me about it all of the time. I’d love to win and try out another color and share my results. Do you have any tips to prevent/help with dryness from cold weather? Thanks so much for kind words. What I use on my system is even during the washing, I mix macadamia natural oil with conditioner and let that sit for about five minutes before rinsing. Always use sulfate free shampoo and conditioner on it.. Then I use IT’s a 10 miracle shine spray and let it dry, after the hair dries I’ll re apply the miracle shine spray every time before I use heat tools. It’s a 10 miracle shine spray has so many great benefits even for your hair, I love it and use it both on my hair and the Tressmerize. Hope that helps. This looks like a great way to try out hair, I’ve been toying with the idea and this would be a great push! It looks amazing! Can you wear the topper or extensions by themselves? Hi Kim, you can! It’s a smaller topper though. So happy someone finally created a “system” – topper+clip in extensions=wow! Can’t wait to try the set out! Wow! This looks stunning! I’d love to try it! Thanks for the opportunity! Hi Michelle, these shades are expect in stock on March 9th. I’ve been so embarrassed about my fine short hair but these look so awesome! I’m so excited that there’s hope for my blah hair! I have a really thinning hairline, can I use this system? Mine is pretty bad as well…you’ll just need to pull it all the way forward and not integrate anything at the front. Hi Marie! I have Tressmerize all the way to my hairline with about 8-9 hairs in front of it. I hope that helps! So I just came across this blog post in the past couple of weeks, and loved the idea and look of this system. I just wanted to share that Emina at Tressmerize is AMAZING! After seeing your blog on this I went to the site and wasn’t sure what color would work best for me. I was thinking of doing the TresChic but it’s out of stock till May. I sent photos of my hair color to Emina and she responded super fast! Like that very hour! And I even had a couple of follow-up questions that she quickly answered. With a bit of help from my stylist to make it work with my bio hair, I’m going with the TressDazzle. Placed my order on a Thursday morning and she had it boxed and a shipping notice sent to me before noon!!!! How’s that for service? So far, USPS is showing that it should be delivered to me on Saturday. That’s awesome. Emina is super sweet, very helpful, and her products look to be great quality! I can’t wait to get my Tressmerize and try it out. My stylist hasn’t dealt with toppers or wigs but she’s brilliant with working with thinning hair and she’s excited to work with me and this new system. Wish me luck on that. 🙂 Just wanted to share my experience so far with Tressmerize. It’s been great. Taylor – Praying my memory holds out, I’ll take one over the next day or two. Stay tuned! waw. But your bio hair is just great. You look gorgeous with the topper, but you are still gorgeous without it. Hi, i just came across this site. You look amazing by the way! I too am suffering hair loss and wear clip in extensions daily (or at least whenever i wear my hair down). I have always been interested in trying a topper. But i have heard so much controversy over extensions… Like they will damage the hair and leave bald spots. Is this true? I cant seem to stop wearing them though. Im addicted and hate my sad thin hair. It is true, that can happen, unfortunately. I know you posted this review last year, but I just read it recently and after reading your review as well as a few others, I decided to take the plunge and purchase a kit for myself. Let me first say, I did not take this decision lightly at all! I went back and forth between the website, your review, you tube reviews and tutorials, and even then, I was terrified, but I have been really struggling with my hair and my self esteem has been literally in the toilet because of it, so I did it. Sadly, it doesn’t work for me. 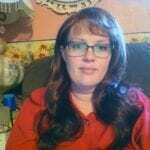 Although it is designed for fine, thin hair, mine must just be finer than most, as even with the help of dry shampoo and hairspray, the clips just wouldn’t stay put and constantly slipped while I was wearing them. I was super worried about them coming all the way out and how embarrassing it would be! Even the topper slipped quite a bit, making the “part” uneven with my own part. Odd, to say the least! The hair is beautiful, top quality, and the color was nearly a perfect match, it was just too heavy for my bio hair and I am struggling to keep it in (on? )my head. It really breaks my heart that I am no better off than before and that I’m also $389 in the hole. ? Try switching out the clips, or, maybe another attachment method like gluing might work? This is one of the most lightweight human hair pieces I’ve seen, and I’d try to exhaust all options before giving up.